The end is almost near for the NBA and NHL seasons. Who will be crowned as a champion this year? We will find out soon enough. The French Open started this past week and has gotten off to a hot start. The marathon known as the MLB season continues on. Finally, the World Cup is about two weeks away and we at SportChaser, are super excited. Are you? 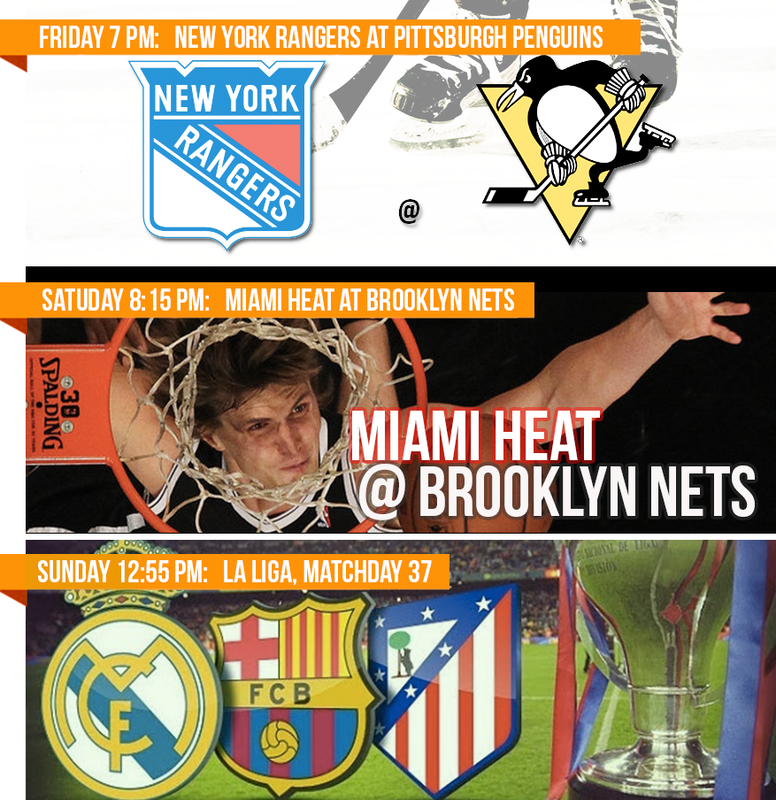 Indiana Pacers @ Miami Heat – Find your bar! The Heat return to their home court to try to finish off the Indiana Pacers and punch their ticket to the NBA Finals. Chicago Blackhawks @ Los Angeles Kings – Find your bar! Will the Blackhawks win tonight and face the Rangers in the Stanley Cup Final, or will the Kings get back in the race? Find out tonight! San Antonio Spurs @ OKC Thunder – Find my bar! Spurs look to advance to the NBA Finals when they take on the Thunder in Game 6 of the NBA Western Conference Finals. After a hard hitting night of hockey yesterday, we get the privilege of another night of awesome hockey. Will two teams lose their dream to hoist the Stanley Cup tonight? Or will we only say goodbye to one? So that being said, let’s look a little closer at these games tonight. When the Penguins went up 3-1 in this series, many believed that this series was over and the Penguins were going to Eastern Conference Finals. But, the Rangers wouldn’t’ allow it and stormed back. The New York team won both Game 5 and 6 and look to make the comeback complete. But let’s be careful! Never, in its history the Rangers came back from a 3-1 deficit. Can the Rangers keep up their momentum to pull off their biggest comeback in team history? Home ice. Home ice has been the name of the game in this series. Each team been victorious on their home ice against the other team. The Blackhawks hold a 3-2 advantage over the Wild going back to Minnesota to play Game 6. Patrick Kane and Jonathan Toews have both been solid in this series with two goals apiece while, Zach Parise prove to be very good for the Wild with four points in the series. However, the Blackhawks probably have had the MVP in this postseason with Bryan Bickell, scoring six goals this postseason, tied for postseason league leaders, including four of them in this series. Let’s look for Left Winger Matt Cooke who made immediate impact in Game 4 and will certainly make a difference in Game 6. Blackhawks are looking to make it back to the Stanley Cup Finals to potentially win back-to-back Stanley Cups. The Wild will try their best to make sure that doesn’t happen as both teams try to advance to the Western Conference Finals. While the Rangers and Penguins have to lay it all on the line. It’s either win or go home for both teams. Should be another exciting night of hockey. Enjoy guys! 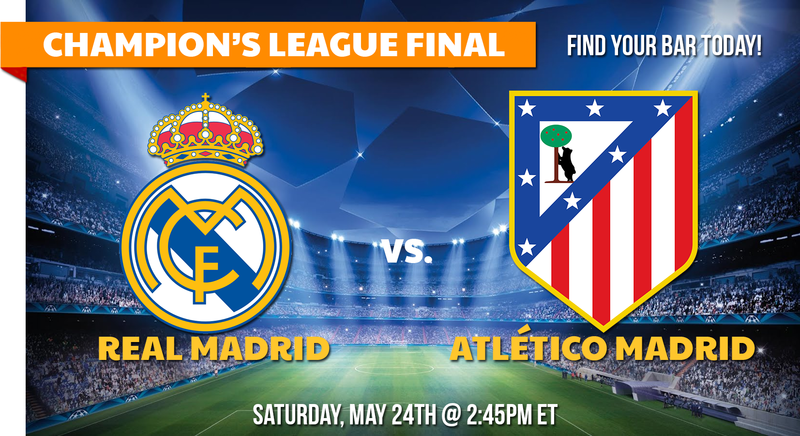 Looking for a bar to watch one of this game in New York City? 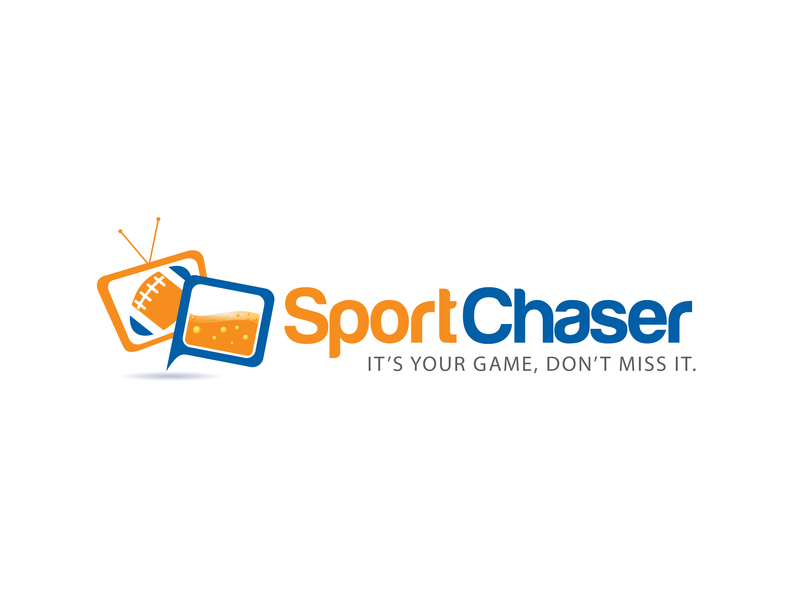 Visit SportChaser.com! Wow, NBA Playoffs have been phenomenal so far! From the multiple overtime games we’ve experienced, buzzer beaters, fake buzzer beaters, 4 point plays, and now, the Bobcats losing. Sorry Bobcats fans, we love you! After all, we are all close to a nervous breakdown, right? NHL fans included! Anyway, we got a bunch of fun stuff this weekend! Obviously we’ll keep an eye open on the end of the first round for the NBA playoffs and the beginning of the second round of the NHL playoffs! But that’s not it! The first leg of the Triple Crown begins on Saturday with the Kentucky Derby and Floyd Mayweather and Marcos Maidana will fight for WBA Welterweight Title. 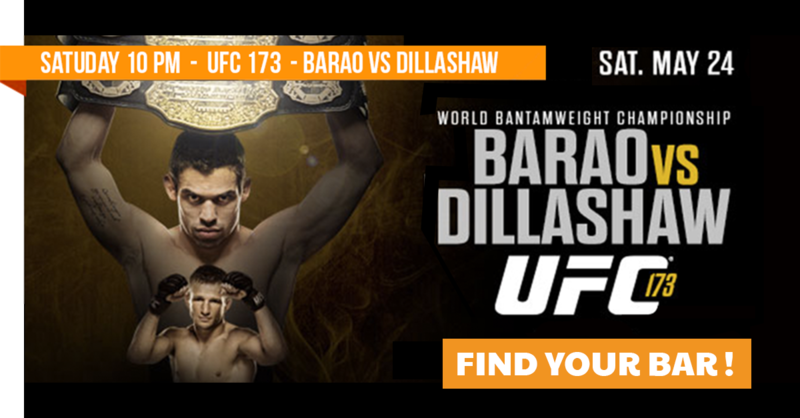 Prepare yourself for an action packed weekend! Enjoy your weekend and don’t forget to find a bar to watch your game! 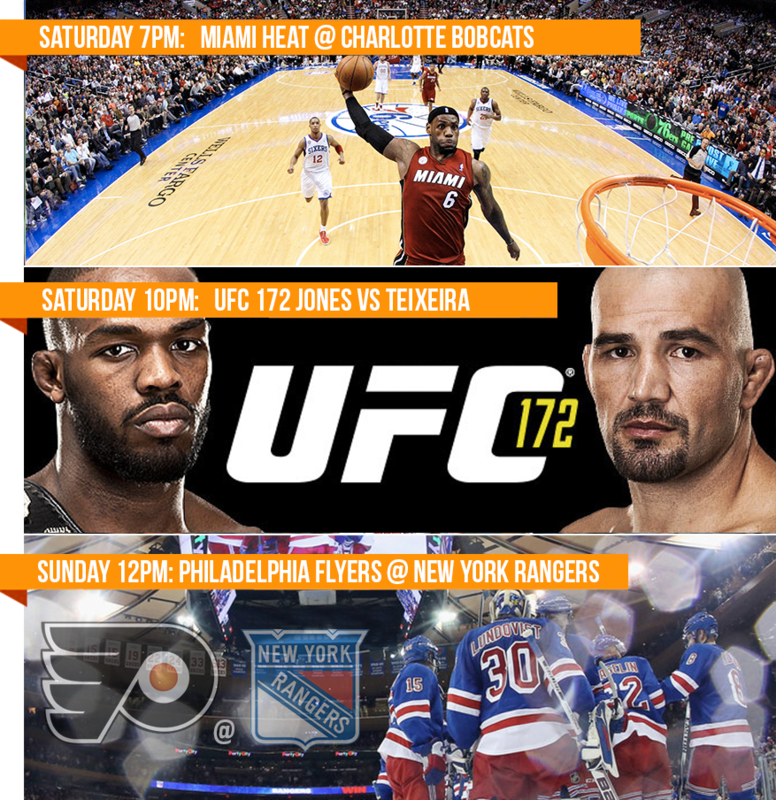 Let’s get a sneak peak of this weekend’s schedule!